Hi, everyone. 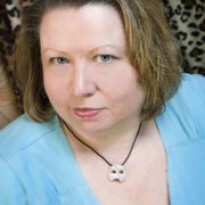 I've been taking a great Udemy course on Blogging for Authors by Jason Matthews. If you're an author, I highly recommend it! Anyway, I've been gleaning some great information ... and, as a result, I'm going to move to a different platform for blogging in the near future. I'll sync that blog here so that you'll still see my updates, but I wanted to let you know in advance so you aren't taken by surprise. I remain convinced that I have the best fans/friends in the whole world. Thank you! Gary Krist examines Progressive era (1890-1930) New Orleans through the eyes of the underworld in this extensively researched book (more than 30 pages of bibliography and footnotes). 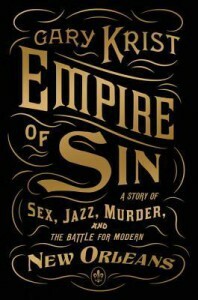 Krist looks at politics, the Mafia, prostitution, and even the rise of jazz music through the particulars of two crimes (a kidnapping and a series of murders) that take place around so-called Storyville, the officially sanctioned red light district just outside the French Quarter. In the text, we learn about some pretty colorful folks, like Tom Anderson (a state senator who had his finger in a great many shady businesses as well as some legitimate ones), Josie Arlington (a rather famous madam), and others. The challenge with this text is that it can sometimes be a bit of a slog to get through. I could only read a few pages at a go, regardless of how colorful the real-life characters were. Krist is a little dry in his presentation ... not quite pedantic, but approaching it. 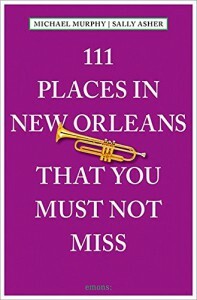 The history is interesting, and the book is worth reading if you're interested in this period in general and New Orleans history in particular. It's just not a page-turner. This little book is a delight! 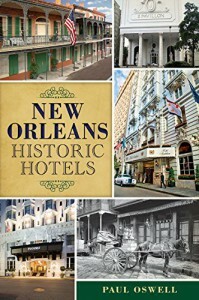 Travel writer Paul Oswell gives us not only the history of the New Orleans hotels he discusses, but also of the site where they are located. For example, in the 1820s, the site of the Royal Sonesta (on Bourbon) was a bakery/coffee house/winery. Each chapter includes an entertaining look at the hotel, as well as beautiful black-and-white photos of interiors and exteriors. It's clear that Oswell enjoys his subject matter, and his authorial voice is personable. It's as though a good friend is telling you about this great place where they stayed. Recommended for travelers and armchair travelers alike. This book was one of the most complicated of the Benjamin January books I've read thusfar. We start out with the murder of one Hesione LeGros, a former plaçée whom Benjamin has not seen since he was a teenager. At the time, she boasted of being one of Jean LaFitte's many mistresses; she was wearing an incredible collar of topaz at the ball where January was playing the piano. Twenty-three years later, she's a broken-down prostitute found dead in the streets ... and no one cares. The second murder victim is Artois St. Chinian, a free man of color who also happens to be the tutoring student of January's sweetheart, Rose Vitrac. When a hoped-for vacuum tube is misdirected and Artois receives a box of guns -- amid rumors of a slave rebellion -- things get complicated. To further complicate matters, Artois is the half-brother of Chloe St. Chinian -- who is now married to Henri Viellard, the protector of January's pregnant sister Dominique. The third murder is at a downriver plantation, Avocet ... where one brother appears to have killed another. January's friend, Sheriff Abishag Shaw, is downriver investigating. So, the plot is a heavy one. It doesn't take long to find out that even the icy, new Madame Viellard is not all that she initially seems. While January is trying to find out what happened to Hesione and Artois, he and Rose join forces with one of Lafitte's former lieutenants to look into matters. Throw in a hurricane, and you have an incredible mix! The subplots all come together in a "whodunnit" that completely blindsided me. The book kept me entertained and guessing throughout. 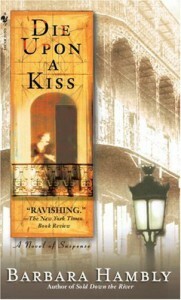 If you haven't already been reading these books, set in Romantic-era New Orleans, and you like a well-done historical mystery -- you need to get started! The books will stand alone, so you don't have to read them in order (I actually started in the middle of the series, as it turns out). Highly recommended. It's hard to say who rescued whom in this book. 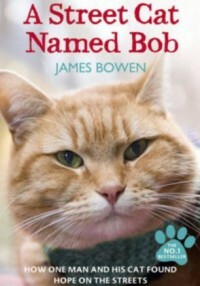 James Bowen is a recovering heroin addict living in a housing project when Bob shows up at the door. James initially thinks the ginger tomcat belongs to a neighbor, but after asking around he concludes that the cat is a stray and takes him in. Pretty soon, the two are inseparable ... and Bob starts giving James a reason to not only get out of bed to do his busking but also to finally get clean and sober from heroin. Bowen talks pretty freely about his life and the challenges he faces, and how important Bob became to him. The book is absolutely charming, and I can't wait to read the other two Bob stories. If I can't share blogs and full reviews (staff no help at all with text box problem), why am I here? Attention staff: TEXT BOX IS DISAPPEARING AND UNUSABLE FOR ME! London Constable Peter Grant discovers something a little unusual while investigating a series of murders: he can see ghosts. Before long, he finds himself apprenticed to Investigator Nightingale ... a wizard. Because he can also do low-level magic. Think Harry Potter meets Sherlock Holmes, and you've got it. 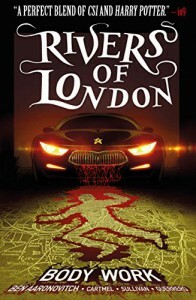 The title is based on the spirits associated with London's various rivers: Mother and Father Thames, Beverly Brook, Tyburn, Fleet, Oxley and more become actual people whom we meet in the course of the investigation. The premise is clever, the "whodunnit" took me completely by surprise -- and the clever use of London's theatrical history as a basis for the plot was simply delightful. I'll look forward to reading more of these books. Disclosure up front: Two of the paired tales in this book were written by me. My review covers the other stories in the volume. One of the things I love about anthologies is the variety. In this book, there are stories by folks as varied as veteran author Harry Turtledove to brand-new authors with just one book under their belts. The stories were all entertaining, but some rose to the forefront for me. Not too shockingly, Turtledove's stories about sasquatches living in the State of Jefferson was a front-runner. 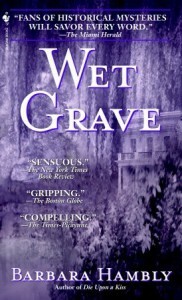 Other delights included Dover Whitecliff's prequels to her forthcoming book, T.E. MacArthur's archaeology stories, and Anthony Francis' new stories about Jeremiah Willstone. All of these stories managed to get a lot of detail into a limited amount of space, and kept me turning pages long past my bedtime more than once. Throw in that proceeds from the book benefit local literacy programs, and you have a winner all the way around. I am working my way through the entire series of Benjamin January novels; I find the recurring characters compelling and the mysteries are very interesting. Plus, they're set against the backdrop of Jacksonian New Orleans, which is a period I'm studying. It gives me a good feeling for the culture. Anyway, this book takes place during Carnival in 1835. January is working in the orchestra at one of the two rival opera houses in town, as they prepare to mount an original production of Othello. To say that this is controversial during the time is to greatly understate the situation. In fairly short order January, his friend the ballet mistress, and other members of the cast are being attacked left and right -- a couple of them fatally. Naturally, January starts investigating. The pacing lagged a little bit in this one. We got to see a lot of the politics of New Orleans opera, which was fine by me, but sometimes it felt disruptive to the other plots concerning a cruel slaver who might or might not also be a smuggler. There was one plot twist I didn't see coming at all, which explained a lot about one character's previous behavior. The whodunnit also took me by surprise, which is harder to do. All in all, the book was pretty good. It just wasn't as gripping as the previous ones I've read. I am a travel book junkie; there's no other way to put it. I enjoy reading books about places I plan to visit, have never seen, and places I have been and loved. This book is a splendid example of why. Two local New Orleanians, one a writer and one a photographer, have selected 111 off-the-beaten-path places in the Crescent City that are at least worth taking a moment to look at. Some of them I had seen; some of them I had no idea even existed. Did you know there's a Mardi Gras tree at Tulane University, that students have been adding more beads to for years? Or that there's a laundromat, Igor's Checkpoint Charlie, that has live music? I didn't either, until I read this book. The photographs are gorgeous, and each of the 111 entries has a "you might also want to visit" in the information section. Technically, this gives you 222 places that you must not miss. There is an entire series of these 111 Things books, and I've put a few of them on my "to read" list. They really are that good. The 101 Dalmatians - Dodie Smith's classic story about Pongo and Missis, looking for their stolen puppies. 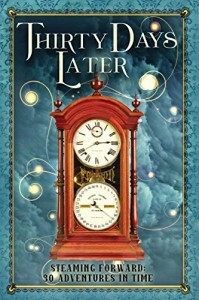 This book is filled with literary references that adults are more likely to get than the typical child, and it's a fabulous adventure. My childhood copy is held together with tape; I still re-read this book from time to time. This book is also the reason that I've loved Dalmatians for as long as I can remember. Little Women - I don't even know how many times I've read the story of the March sisters. This 19th C. novel may feel a bit dated to some, but the story never fails to make me glad for my sisters of choice. Black Beauty - Another book that I can't say how many times I've read. Anna Sewell's story of the black horse whose circumstances changed so many times led many to the anti-cruelty movement in the 19th C., and remains a beautiful story of love and kindness winning out to this day. Behind The Mask...No More - This memoir was written by a man whom I was proud to call friend. The late Byron Nease talks about his struggles with depression, with coming to terms with being gay after a restrictive religious upbringing, and living with HIV. The book is both frank and charming, as Bud was himself. The Phantom of the Opera - This will surprise no one, I'm sure. Leroux's scathing commentary about Parisian society, wrapped up in a story of obsessive love is not to be missed.